Rack-in-a-Box has been designed specifically for harsh weather conditions and only the highest quality materials are used in its construction. Its durability is matched with an industry first 12 year warranty and is compliant with the latest requirements of most International Standards. In addition to standard installations Rack-in-a-Box can be used in rural areas, on hill side and hill top sites and in cyclonic regions, by including additional roof brackets in the installation. Rack-in-a-Box has a number of unique features setting it apart from its competitors and allowing it to cater for every type of installation no matter how complex. These unique features not only make this the most secure solar mounting system but also make it the most adaptable. 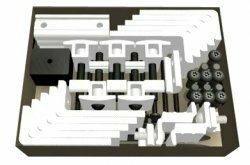 Rack-in-a-Box provides your customer with unequalled security for their valuable solar investment by introducing the Lock Solar Security Head Screw. Every mounting system is provided with a Lock Solar Security Head Key, providing your customers with peace of mind. With an industry first Adjustable Mid Clamp and Adjustable End Clamp Rack-in-a-Box is adaptable to suit all frames sizes so you’ll never again have the problem of needing multiple size clamps for different jobs. Rack-in-a-Box also introduces an Integrated Cable Management Rail that allows all cabling to be neatly placed out of eye view and the unique Twist Lock Cable Tie assists you to keep all cable tied together and attached securely to the rail. Rack-in-a-Box offers all of these groundbreaking features as well as encompassing all components necessary for any installation and conveniently packaged into only 1 box.